A school has been fined £16,500 after a 16-year-old pupil lost eight fingers when her hands got stuck in a bucket of plaster of Paris during an art lesson. The girl was making a cast of her hands in January 2007, magistrates in Boston, Lincolnshire, were told. The plaster heated up and set. Neither staff nor paramedics could get it off, leaving the pupil at Giles School in Boston with serious burns. The school admitted breaching health and safety rules. It also admitted failing to report the matter to the Health and Safety Executive (HSE), which only found out about what happened from the girl's plastic surgeon. The school was also ordered to pay £2,500 in costs. The court was told temperatures of up to 60C can be generated in large quantities of plaster of Paris. Jo Anderson, prosecuting for the HSE, said the girl had been told by her teacher to put her hands into clay to make a mould. She was then supposed to pour the liquid plaster into the clay mould. Instead she put her hand up to the wrist into the bucket of plaster. It is understood the mixture began to solidify within about 10 minutes and she soon realised she could not remove her hands. "The student's hands were literally being burnt as the plaster was setting around them," Miss Anderson said. "There was no way the student could or should have known of the catastrophic consequences." 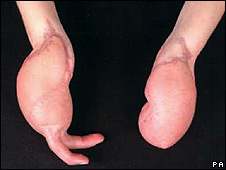 Plastic surgeons did what they could to help the girl, but after 12 operations she was left with no fingers on one hand and just two on the other. Speaking outside the court, the girl's solicitor, Stephen Hill, said his client was a "remarkable young woman" who hoped to go to university and become a teacher working with nursery or primary aged children. He added: "She is doing remarkably well considering the devastating injuries she did suffer. "But she is a very stoical. She is a very determined, self sufficient character but she is now only left with one forefinger and an index finger." Mr Hill said his client had now had enough of surgery. It had not only left her with just two fingers, it also with severe scars all over her body where the plastic surgeons had taken skin for grafts. The school issued a statement which said it was proud the girl had returned to school and gained three A-Levels. It added: "We would liked to reassure all pupils and parents that our health and safety procedures have been rigorously revised. We are confident that such an accident cannot occur again at our school."